As noted previously, Jesus’ arrival in the “district of the Decapolis,” while technically Gentile territory, was even in Jesus’ time, the home to many Jewish communities. The Decapolis (literally, “Ten Towns”) figures quite prominently in the ministry of Jesus (Mark 5:20, Matt 4:25, Luke 8:26). While many of the cities’ names would be foreign to our modern English ear (Gadara, Abila, etc. ), one of the city names would be quite familiar: Philadelphia. The man suffers with defective hearing and speech. The man was not born deaf else he would not have been likely to learn speech. Thus, it is most likely that injury or illness robbed him of his ability to hear. Mark uses a rare word to describe the man’s “speech impediment” (v.32; Greek mogilalos literally “difficult speaking”.) Many scholars find an certainly an allusion to Isa. 35:5 and following which celebrates God as the one who comes in order to clear the ears of the deaf and to provide song for the man of inarticulate speech. What is Asked. 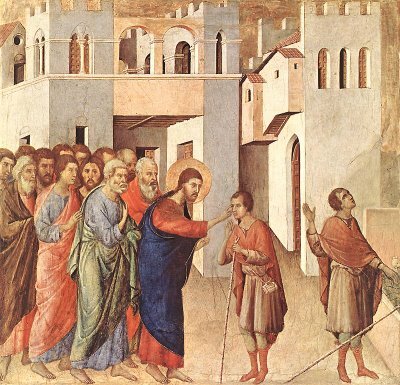 And people brought to him a deaf man who had a speech impediment and begged him to lay his hand on him. The actions described lend themselves to the intimacy of the encounter: “He put his finger into the man’s ears and, spitting, touched his tongue.” These are actions that can only be done in a very personal one-to-one encounter. All the actions of vv.33-34 were mirroring the man’s present need, the process of healing, and the source from which such healing alone could come, in a way which even a deaf mute could understand. Jesus’ gestures are “sacramental” in that they effect what they symbolize, the opening of the man’s ears and the loosening of his tongue. This is all very personal. There is even the suggestion of intimacy in the other of Jesus’ actions: “then he looked up to heaven and groaned, and said to him, “Ephphatha!” (that is, “Be opened!”).” The geture of “looking up to heaven” is less one of prayer than a sign of Jesus’ intimacy with God (cf. 6:41; Jn 11:41; 17:1). Similarly, Jesus’ “sighing”; it might simply be a sign of his deep emotion over the man’s condition. But then as some scholars hold, it may be a sign of Jesus’ transcendence, which is constrained by human limits foreign to it. In other words, the sighing might reflect a deeper longing for a return to the Father where Jesus too can experience the fullness of existence. Mark has retained the Aramaic ephphatha. It’s Greek equivalent, dianoigō, relatively rare in the NT, occurs 33 times in the LXX, most notably in Ez 24:27: “Your mouth shall be opened, and you shall speak and shall no longer be dumb.” The act of healing itself was accomplished with the word of liberation addressed not to the defective auditory organs but to the man as a whole person. The results of Jesus’ actions are simply described: the ears were opened, the tongue was loosened, and the man began to speak clearly. The Reaction – They were exceedingly astonished and they said, “He has done all things well. He makes the deaf hear and (the) mute speak.” This allusion to Is 35:5-6 brings out the theological lesson of the cure: the age of Messianic salvation, announced by Isaiah, has arrived with Jesus. Hearing and speech have a symbolic role to play in Mark’s narrative. The Syrophoenician woman was so skilled in speech that Jesus healed her daughter. Jesus’ disciples, on the other hand, have shown increasing difficulty in understanding what Jesus is telling them. They clearly need some form of healing that will enable them to truly hear—that is, to understand. Understanding, on the other hand, can be expressed to others only if we speak. Young children learn how the world around them works, whether that is the physical world or the world of human interactions, by repeating everything they hear. Schoolteachers once required that pupils recite their lessons. Now that such training has become rare, college and graduate students often fail to understand what they read, and trying to explain it without using the words of the source material creates havoc. It is fair to say that unless people can tell others what they know, they do not really know it. Believers need to recognize the need to speak about their experience of salvation. They speak to others in testimony and to God in thanksgiving and praise. Mark 7:31 district of Tyre: an ancient town on Phoenician coast. Tyre is located about 40km south of Sidon. Before the time of Alexander the Great, Tyre was an island but only 600–750 meters offshore. But since the time of Alexander the Great the island has been linked with the mainland by a causeway, which has broadened over the centuries so that now the location is a peninsula. [ABD, 686] Decapolis: a group of Hellenistic cities located east of the Jordan and Lake Tiberias. This entry was posted in Scripture and tagged ephphatha, Mark 7-31-37 by Friar Musings. Bookmark the permalink.